In Lone Pine Koala Sanctuary, BRISEBANE, QLD, Australia, Feb. 25, 1997. We (my wife and I) had throught Major Mitchell's Cockatoo called "MOMOIRO-INKO" which means "Pink Parrot" in Japanese. For the bird called Pink Parrot in English is not a Galah but a Major Mitchell's Cockatoo. Returning to Japan, we found our mistake in bird guide books. 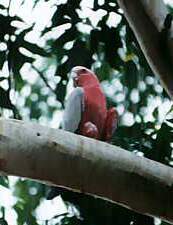 As is apparent from the photo, Galahs are a deep pink in color. (I would not call it pink in my opinion). From a Japanese couples, Diary of their Australian Holiday.